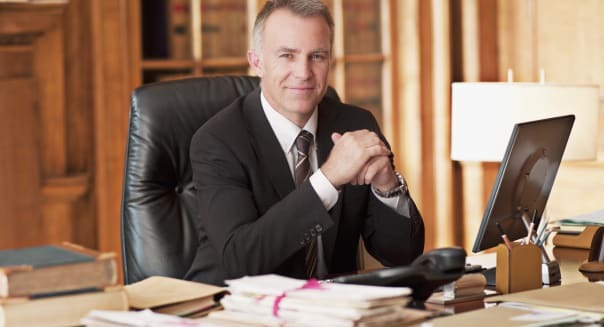 What Qualities Matter Most When You're Hiring a Lawyer? Few people enjoy hiring lawyers. That's just a fact. If it takes a serious automobile accident, a divorce, or a death in the family to get you into a lawyer's office, then pretty much by definition, you're visiting under duress. But when trouble strikes and you actually need a lawyer, how do you pick one? According to Lawyers.com, the cost of legal services varies widely, from as little as $50 an hour to as much as $1,000 "or more." With such a wide range of prices to choose from, you'd think that the first factor people would look for in a lawyer is price -- specifically, a low price. Something closer to that $50 mark than to the $1,000, and as far away as possible from that ominous "or more." %VIRTUAL-article-sponsoredlinks%That turns out to not be the case. Earlier this month, online "legal Q&A forum, directory and marketplace" Avvo.com asked its users what they look for in a lawyer. While cost certainly was a factor (65 percent of respondents called it "very important"), it wasn't as important as "respect in the legal community," which 67 percent of those surveyed think is more important, or "track record" (80 percent). So it would appear that hiring a lawyer is actually a bit like buying a car. Price plays a role, of course, but more important is buying the right product, and getting good value for your money. Further bolstering the point, it appears that people who have more experience with lawyers are even more inclined to choose perceived quality over price. As Avvo's results reveal, the people most likely (72 percent) to pick a cheap lawyer over a good lawyer are those who've never used a lawyer before. All other things being equal, though, what specific qualities should you look for when choosing between two lawyers charging equivalent prices for their services? 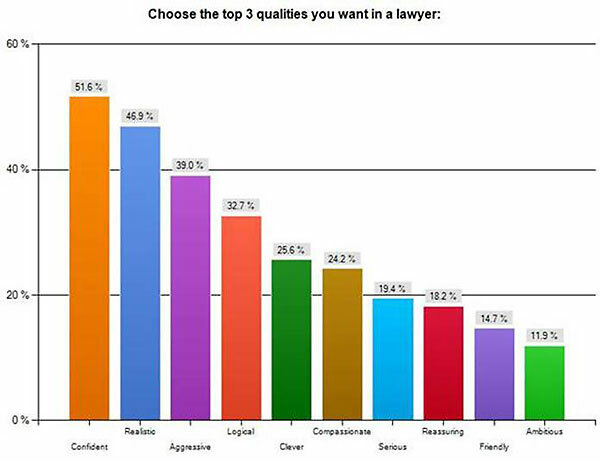 According to consumers polled by Avvo, the top three personal qualities that most customers look for when choosing a lawyer are confidence, realism, and aggressiveness. These beat out qualities such as friendliness, ability to reassure a client, or compassion. As Avvo explains, the feedback it got from its respondents is that when seeking a lawyer, they're looking for someone who's "a realistic go-getter" rather than "a hand-holder." And again, this makes sense. After all, the law is a complex thing. Most of us would much rather leave it alone, and not have to deal with it if at all possible -- which is one reason we avoid lawyers in the first place. It makes sense then that if you do run into some bad luck and find yourself with a legal dilemma that absolutely, positively, must be dealt with by a lawyer, you'd prefer to hand it over lock, stock, and barrel to a confident, realistic, and aggressive professional and let them deal with it. And really, for $1,000 an hour "or more," that's the least they could do. Motley Fool contributor Rich Smith practiced law for 15 years (before coming to his senses). In all that time, though, he never chased an ambulance. Because that's what interns are for. The Centennial State eliminated the tax exemption for non-essential food items and packaging that can come with your food or beverage purchased at your local eatery or convenience store. Sales and purchases of nonessential food items and packaging provided with purchased food and beverage items are taxable at the state sales and use tax rate of 2.9%. So while cups are considered essential, cup lids are not and, hence, are taxable. French fry sleeves are not taxable but expect to pay sales tax on napkins and towelettes. When Halloween comes around, Indiana residents may be better off buying a pre-made costume. Indiana's Department of Revenue decided that sales tax could be applied to labor and design of custom-made costumes due to existing law about "retail unitary transactions." In other words, a combined sale of tangible personal property and services becomes taxable when the services are performed before the transfer of the property. Under federal statutes, state or local governments can't taxes airlines and airport users. But in Kansas, taxes can be imposed on "any place providing amusement, entertainment or recreation services." The state's Department of Revenue concluded that the sales tax could be applied to tethered hot air balloon rides only. After an uproar about how non-residents could buy boats and repair parts tax-free if they moved their boats out of state within 30 days of purchase and kept them out, Augusta lawmakers amended the law. Non-residents have to pay 40% of the sales tax if they brought their boats back into the state or kept them in Maine for more than 30 days. Residents, however, remain out of luck: they must pay the full sales tax on the sticker price of the boat and repair parts. In the 1960s Washington added a retail sales tax that would be charged at any business that offers customers the "opportunity" to dance. According to ABC News, many Washington businesses complain of arbitrary enforcement of the statute. The state legislature is considering a repeal. Proponents of the repeal say enforcement targets medium-sized venues or taverns, and not places like sports stadiums that often host concerts where people dance. Recently, Century Ballroom in Seattle and was hit with $250,000 bill on back taxes for not adhering to the law.